I am an epic, epic nerd, but I am so excited about the Avatar comic that I bought while visiting a friend in Chicago this week. I love this show, I will be posting a squeeful post all about it as soon as I read the book, you will all have to be subjected to it for ages as soon as the sequel starts coming out this fall. Also, this is the first book I’ve actually bought new in…at least three months. I’m rather proud of myself. Where I got it and why: as a free ebook from Net Galley, courtesy of IDW Press, in exchange for a fair and honest review. Thanks, guys! I read about this in Peter S. Beagle’s newsletter, but I was waiting for the trade to actually pick it up; the comic book store that is okay with girls is out of my way, and I prefer to collect trades anyway. Recommended? Oh god yes. This is gorgeous. And if you’re not familiar with the story, this would be a fantastic introduction. Review: When I was a kid, there was a movie rental place across the street from my grandmother’s house. You went in the door, down a couple of steps, and turned left into the children’s area. There, under the picture window, on the second shelf from the top, was where the VHS of The Last Unicorn lived. I adored that movie, and I’m sure I contributed substantially to the demise of that poor videocassette. When I was a little older, I discovered the book, and I loved it even more. This is one of my favorite stories, all about myth and meaning and magic, so of course I was thrilled when they announced a graphic novel adaptation, and I am overjoyed to tell you that it is not disappointing. 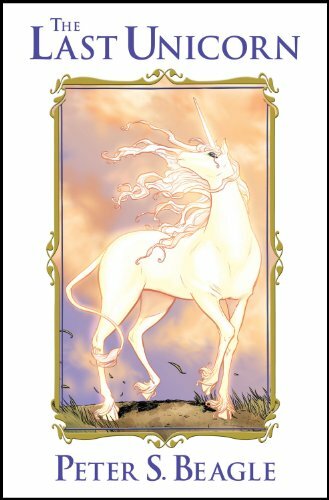 The art, of course, is the real draw for a Last Unicorn comic book, and it’s spectacular. It does seem to be a little bit inspired by the movies – there’s a strong resemblance in the art for many characters, particularly the side characters who show up and then vanish again. Schmendrick looks much more like his description in the book than he does in the movie, which I like, but Molly looks younger, which I don’t. I do like the way the unicorn is inked in a reddish sepia rather than the black of everything else; it makes her stand out and glow (which I think is another trick they used in the movie, now I think of it). And then when the Red Bull arrives! The chapter two cover featuring Mommy Fortuna is my favorite, though. She’s always been one of my favorite characters, and the drawing of her with all these little charms and tiny figures tied in her hair is perfection. While the movie will always have a fond place in my heart, and the book will always be the most spectacular, this incarnation of The Last Unicorn is a perfectly respectable edition. The art is always good, and sometimes breathtaking, and while there are flaws in the script it does seem to grasp the point of the book a little bit better than the movie does, and to bring some of the quality of heartache to it that the book does so well. If you’re a fan of The Last Unicorn already you’ll want to buy the hardcover for your collection (I know I will); if you’re unfamiliar with it, this is a wonderful place to start. Morpheus, in Neil Gaiman’s Sandman. Using a graphic novel series is not cheating, Sandman is as epic as any novel. And it has the benefit of containing simultaneously the saddest and most satisfying character death. I have now spoiled the Sandman virgins enough for one post; if you have not yet read the series, go out and read it immediately. You may wish to start with Volume 2, if you are not generally a comic book reader, but you will want to read Volume 1 eventually anyway. Get the new recolored editions, if you can, they’re a vast improvement over the originals. Come back when you’re done. Spoilers will commence behind the cut. I picked this up while I was browsing the mythology section for faerie books. I didn’t find any, but I did find this, a history of the Western conception of monsters and monstrosity. It was interesting, but alas, not as good as I would have liked. I found by the end of the book that I was having to fill in the details of examples he was using from my own knowledge — not that the stories were wrong, per se, just drastically incomplete. This makes me distrust the earlier bits of the book where he was discussing things I didn’t know much about already. At least I acquired a nice long reading list from it. A book about the dysfunctionality of the American criminal justice system, and how it (mostly based on the War On (Some) Drugs) functions as a social control system that keeps black (and brown) Americans in the position of second-class citizens. Overall I found it was nothing I hadn’t heard before, but having it all in one book, with all the connections drawn, was illuminating. Alexander says she hopes that this will open a dialogue about the problem, rather than being the definitive work on the subject, and I hope that it does, because I don’t see any way of fixing the problem without replacing all our legislators with pod people who believe in rehabilitation over punishment. More Cadfael! (I find Cadfael strangely soothing.) I did not have the redundancy problem with this book that I had with the last one, largely because the ending of Monk’s Hood the TV adaptation is completely different than the ending of Monk’s Hood the novel. For one thing, the novel has much more Welshness. (I should get my sister to read these, she studied abroad in Wales and has become very fond of the place.) Cadfael is also causing me to dig up more histories about twelfth century Britain – did you know about the war between King Stephen and the Empress Maude? This is actually two books as an omnibus, those being Shards of Honor and Barrayar. (I am reading in chronological order, yes.) Really, though, they don’t seem like separate books at all, and according to the afterward, they almost weren’t. I love Cordelia; she’s a wonderful character, strong in her own right without being military, willing to go to unbelievable lengths for things she really cares about (like the life of her unborn son), and completely divorced from the politics of the society in which she finds herself living. Also, I grew so attached to Kou in his brief appearance in Shards that I absolutely cheered out loud when he showed up again in Barrayar. Yes, I bought this when it came out and it took me this long to finish it. I got bogged down in the beat poetry section (which was pretty terrible, and I say this as someone who actually enjoyed large portions of On the Road). You know, sometimes Alan Moore is brilliant, and sometimes he’s insane, and I suspect that this book is just exactly the wrong combination of the two. It feels like it’s trying to be much more important than it is. And it’s much less fun than the first two. Being an omnibus of The Warrior’s Apprentice, the short story “Mountains of Mourning”, and The Vor Game. This is where we’re introduced to the main character of the series, Cordelia and Aral Vorkosigan’s son Miles. (Elli Quinn says to Ethan in a later book, “Look for a big pile of trouble with a squiggly-minded little man on top.” That’s a remarkably good description of Miles.) Warrior’s Apprentice is, of course, named after the story of The Sorcerer’s Apprentice, and it shows. It’s an insane amount of fun, one accident piling on top of another one, until Miles has accidentally acquired a mercenary navy. And then, in Vor, he acquires them all over again. And in the middle, in “Mountains of Mourning,” he’s back at home on his family’s land, working out the small (and yet simultaneously not-so-small) problems of a small hill village. I recommend the omnibus for this order as much as anything; it carries a wonderful impact. Being a compendium of Cetaganda and Ethan of Athos, and the short story “Labyrinth” (which I’m actually still reading as part of Borders of Infinity, shh). I adored Cetaganda for the old-fashioned sci-fi worldbuilding and the amazing political structure where women seem to have no power and yet also manage to control the empire, and also for Ivan. I’m becoming very fond of poor Ivan Vorpatril, prettier than Miles bot not as brilliant, and he knows it. Ethan is also spectacular for the worldbuilding, and I think the plot is stronger too, and boy is that laying some interesting ground for what’s going to happen in this universe in forty or fifty years. Athos is a planet without women — it’s clearly been founded on misogynistic principles, but it’s hard to call any of the men who live there misogynistic, because they have absolutely no experience with women whatsoever. I found it interesting that while the planet was founded in order to help men escape from the evils of women, in the wider universe it’s known (if it’s known at all) as Planet of the Gay, and Ethan gets beaten up over it. One of the things I like about the Vorkosigan saga all together is it’s clearly very interested in the power and position of women in a society. There are no women at all on Athos, but there are donated ovarian cultures; on in the Cetagandan empire the highest-class women travel in opaque bubbles so they can never be seen, and are genetically engineered (by their own hands) for supreme beauty. On Barrayar women have very little power, but on Beta Colony they’re quite egalitarian (and Betan Cordelia is astounded when the Barrayan Emperor entrusts her with the education of his grandson and simultaneously tells her she’ll have no power; clearly she cannot believe that educating the future Emperor is a powerless position). Women serve in the Dendarii Mercenaries the same as men do (as well as one hermaphrodite). Miles has a tendency to want to be the Hero, rescuing the Damsel in Distress, but he’s very good at acknowledging when the Damsel no longer needs to be rescued. It’s not something I’m used to in science fiction, and I love it deeply. Last in the Eden Moore series, and still awesome. Now with zombies! This book is pretty apocalyptic, what with the flood of Chattanooga and the undead coming out of the darkness — not to eat people, in this case, but at the behest of an angry twelve-year-old ghost who can’t be stopped or comforted. I love the…well, the realism, for lack of a better word, of Priest’s ghosts. They act just like people do, only more frustrated, because they’re dead. I blogged about this a little earlier in my 30 Days of Books series, too. Like I said there, it’s a pretty fascinating overview of what we know, scientifically, about how traffic works — not only how people drive, but how patterns and trends emerge, and what to do about them. There’s a whole chapter on my favorite insight about traffic, which is that roads are safer the less safe drivers feel, largely because when drivers feel safe they speed and when drivers feel unsafe they slow the hell down. You know, I don’t have to look at this book and think, Was I ever like that in high school? I know I wasn’t. I just wasn’t that type of teenager; I couldn’t wait to grow up and get out into something that more closely resembled civilization than high school does. I enjoyed this book nonetheless. The girls are bright, their fights are indeed about real things high school girls fight about, and their solutions are occasionally brilliant. I don’t think I’ll read the rest of Myracle’s books, it’s just not really my thing, but I would have no hesitation about recommending them to people for whom this is their thing, particularly high school girls. I don’t know why they decided to publish the last three volumes of this series all in one gigantic brick, and I have to say, I’m kind of annoyed about it. The stories themselves, though, are as wonderful as ever; Ginko is brilliant and slightly sneaky, the mushi are tremendously alien, and all of the stories have an excellent meditative kind of feel. They’re like haiku in manga form. Supernatural haiku. I love it, and while I’m sad there won’t be any more, I don’t think the series is lacking in any way. I picked up this because the sequel, Lincoln’s Sword, just came out (Jim posted about it on Making Light) and I’d never even heard of this before. Light fantasy-universe Civil War? With boats? I’m there. 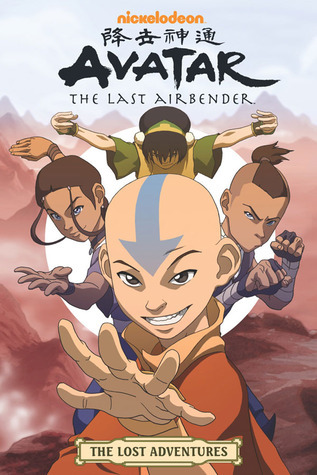 I didn’t actually enjoy it as much as I expected to, and I’m not sure why; I liked the main characters well enough, and the basic plot (Union supernatural ship versus Confederate supernatural ship, with undertones about slavery and how far it’s acceptable to go when fighting evil), but it felt a little thin. I’ll still probably pick up Lincoln’s Sword when I have a moment. Third in the Immortals series, and I think possibly the best. This is where Daine does most of her growing, empathy-wise, and while a lot of it happens a little bit in the background, I think that’s a valid way of trying to get across some complicated things. Rather than the European-fantasy world most of this series takes place in, here we are in Carthak, a kind of North African-fantasy world. (Not entirely Egyptian, but not really Middle Eastern, either. I like it a lot.) I love the depth this setting adds to the world; Carthak is just as complicated a place as Tortall, in the end. This is the first eight graphic novels of The Walking Dead all in one massive book, and I have to say, don’t read this unless you have a surface to rest it on. My wrist ached for days. Anyway — I read volume one of this series sometime last year, when I still thought I was writing a post-zombie apocalypse novel. I’ve since gotten rid of the zombies, but I remembered kind of enjoying the graphic novel, so I got this from the library when I was feeling like something post-apocalyptic. This series is the graphic novel form of everything I liked about 28 Days Later — it’s less about the zombies than about what people can do to each other when their support structures fall apart. It’s pretty much relentlessly horrible (they have a little party when it’s been a month since someone died, about three-quarters of the way through the book), so I can’t recommend it unless you really like that kind of thing, but I sometimes do. There’s only one graphic novel out past this compendium, and I’m a bit relieved I don’t have much more to catch up on. I honestly do not know why I finished this book. I made a deal with myself sometime last year that life is too short to read books I hate, but I think that by the time I decided I hated this book, I was within fifty pages of the end and it seemed like a waste not to keep going. The plot was all right, and I rather liked the antagonist — Narcissa Snow, a woman with just enough supernatural in her to make her not-human, but not enough monster in her to make the mosters accept her, which was driving her crazy — but the protagonists were obnoxious and tedious, and their marriage was even more so. I’m a little disappointed, I wanted to like Kiernan’s stuff, so I might try out The Red Tree anyway, but this book…ugh. I am on a book-finishing roll. Second in the previously-gushed-about Immortals series. I admit I don’t like this one as much as the first; where Wild Magic features tons of characters from the Alanna Quartet, plus some new ones as well, this one is almost all just Daine, the wolf pack, a girl from the Dunlath fort, and the basilisk Tkaa. I don’t know if it’s because they’re all new characters, or if it’s because they’re so isolated, both physically and in their concerns, but Wild Magic (and the sequel, Emperor Mage) feel much richer than this book. Not that I don’t love it, mind. It’s just the least-awesome of the four. A graphic novel about…well, lots of things. On the face of it, about a phonomancer — a magician who uses magic as his medium — attempting to save himself and the memory of BritPop from retromancers — magicians disguised as DJs who play nothing but old music in an attempt to make people feel nostalgia, which they feed off of. You can kind of see the other things they’re playing with from that; music and pop culture, of course, the difference between nostalgia and memory, what it means to be shaped by your past. I liked it, even though the main character was a wanker. (He knew he was a wanker, but that didn’t stop him, which is exactly the kind of person I hate the most.) I’ll read the other books in the series if he’s not the main character any more. As usual from him, a book you can’t even begin to talk about sensibly unless the other person has also read it. Reviewing without spoilers is complicated. Basically: this book takes place in two cities that occupy the same space, Besźel and Ul Qoma. (Do you know how long I had to hunt for that accented z? I finally gave up and pasted it from Wikipedia.) That is, citizens of Besźel live in their streets, some of which are all Besźel and some of which are part Besźel and part Ul Qoma, and they go about their days and if they encounter any citizens of Ul Qoma (as they are bound to do), they unsee them. Act as if they aren’t there. Same with buildings, cars, smells, sounds…everything. (Obviously tourism is somewhat complicated.) One day a murdered woman turns up in a Besźel slum, and it seems that she was killed in Ul Qoma and dumped in Besźel, which is a breach, which is handled by Breach, a shadowy, mysterious, and entirely creepy organization that stringently enforces the boundaries between the two cities. But Breach won’t take the case (since, it turns out, there was no breach involved), and the poor inspector who started working on the case is stuck with something much, much more complicated. It’s an amazing book (featuring two of the most incredible chase scenes ever), and the effort it takes to get started is entirely worth it in the end.